Find the best archive type! any files with a right-click. Increase your disk storage in a single click, while Windows is still running - ideal to compress remote servers. LZS85 is designed to provide better compression on computers running Windows 10/Server 2016, while LZS80 fully supports older Windows versions (including XP). Enter an exclusive compression mode directly from your PC's boot menu, without using an external USB device. LZS90 achieves a compression ratio of 2.4:1 on a clean 64-bit Windows 10 installation, meaning a 128 GB SSD acts like a far more spacious 307 GB SSD! 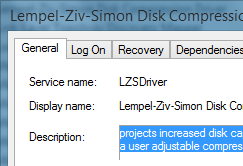 Lempel-Ziv-Simon Disk Compression doubles your boot disk capacity and quadruples your data disk capacity. Access to compressed data is completely transparent – all of your installed applications run normally, and all of your files remain fully accessible as if they were not compressed at all. Should you want to go back at any time, you can easily undo all changes made by Lempel-Ziv-Simon Disk Compression, and lose nothing – except the extra space! ZIPmagic's Outlook Add-In integrates with every version of Microsoft(R) Outlook(TM) to auto-magically compress your email attachments when you click the "Send" button. Toggle compression on/off with the single click of the mouse, choose a different compression format, and even tweak compression algorithm parameters right within Outlook. Encrypt your data with 256 bit AES secure encryption and protect your sensitive data from prying eyes. 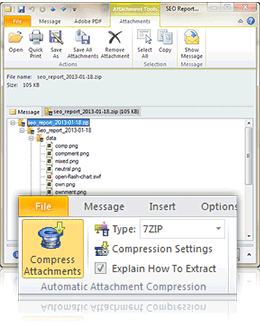 ZIPmagic's Outlook Integration does not stop with just attachment compression. Up to 61 different types of archive formats may be previewed when received as email attachments in Outlook. Double-click any file inside an archive preview to open it! 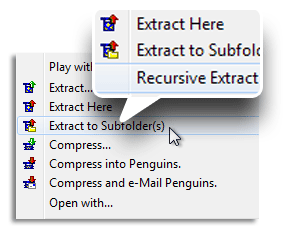 Does your archive management utility create two levels of subfolders when you choose the "Extract to Subfolders" option? ZIPmagic is smarter, creating a parent folder only when it determines the archive doesn't already contain all of its files inside a master folder. Do you need to ensure no compressed files are left behind after extracting? Choose the "Recursive Extract" option and watch ZIPmagic sift through all archives nested inside one another for you. How to Compress Files to Get the Smallest Possible Size? First, in Windows Explorer, highlight the files and folders you want to compress. Next, right-click this selection of files and choose the "Find Smallest Archive" menu item. ZIPmagic instantly benchmarks all available compression algorithms on this live data set! You may not already know this, but each compression algorithm has its own strengths and weaknesses - there's no single "best" one for all possible files. Fortunately, you now have a single-click way to find out how to compress files for the smallest possible size, every time! Stop the religious wars, end the guesswork - let ZIPmagic do the heavy lifting for you.